Tim Firth’s whimsical text, Neville’s Island, arrives in London following a successful and critically acclaimed run at Chichester Festival Theatre last year. 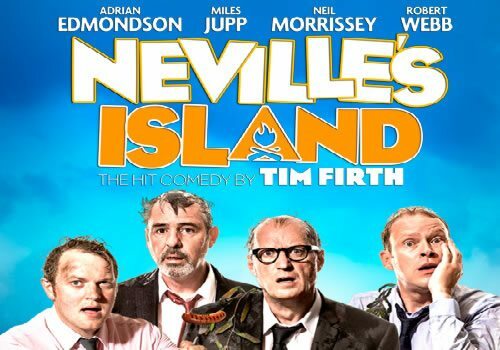 Back this year with some big name comic actors at its helm, Neville’s Island takes over from similarly comic play Jeeves and Wooster at London’s Duke of York’s Theatre. Firth’s text tells the tale of a team building holiday exercise gone horribly wrong as four middle management execs find themselves stranded on a small island in The Lake District. What sounds like the premise for a harrowing horror story is actually the basis for two acts of comic mishaps, exacerbated by the fact that all the chaps have in the way of supplies is one measly sausage! Angus Jackson directs original cast member Adrian Edmondson as Gordon as well as new cast members Miles Jupp, Neil Morrissey and Robert Webb. The four actors promise to be a quartet of side splitting comedy! Robert Innes Hopkins brings his praised set designs to the Duke of York’s, accompanied with lighting by Howard Harrison, music by Isabel Wallace Bridge and sound design by Paul Goothuis. Neville's Island tickets are currently on sale and the show is booking until January 2015. Neville's Island is a story about four men on a middle management team building holiday and is therefore not aimed at Children. However children aged 12 and up are welcome to see the show when accompanied by an adult.